The current volume consists of essays written by Prof. K. Rob V. Wikman, dealing with the Swedish 18th century botanist and zoologist Carl Linnaeus (Carl von Linné). The texts focus on Linnaeus’ ideas of natural magic and their intimate connection to his opinions of the natural condition of humanity and divine retribution in this life – a theme that had not been investigated previously. Furthermore, the elements of folklore in the writings of Linnaeus, his moral and social attitudes and his philosophical heritage are highlighted in the essays. 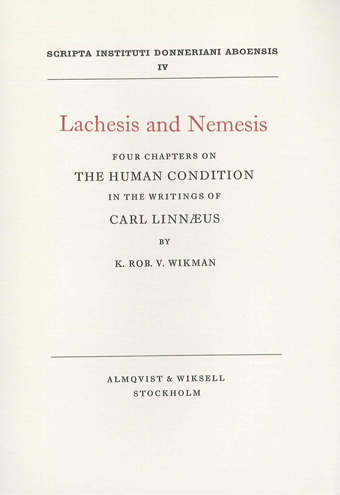 For Linnaeus, the Hellenic mythical figures of Lachesis and Nemesis function as symbols for his views about human life and conduct.